By buying this product you can collect up to 7 loyalty points. Your cart will total 7 points that can be converted into a voucher of MYR1.05. Orifera Aromatic Winter Body Oil. We used advanced centrifuge technology to remove from the coconut oil such as water, sugar, protein and carbohydrates and other impurities. These yielded high purity coconut oil. Fatty acids at different temperatures gradually filtered and added to the pure coconut oil. With these technology our coconut oil will not solidified below 24 degrees and yet remain high concentration of lauric acid. The fine molecular coconut oil is more easily absorbed by the skin and has fantastic therapeutic effect; particularly convenient to use in cold and dry weather. 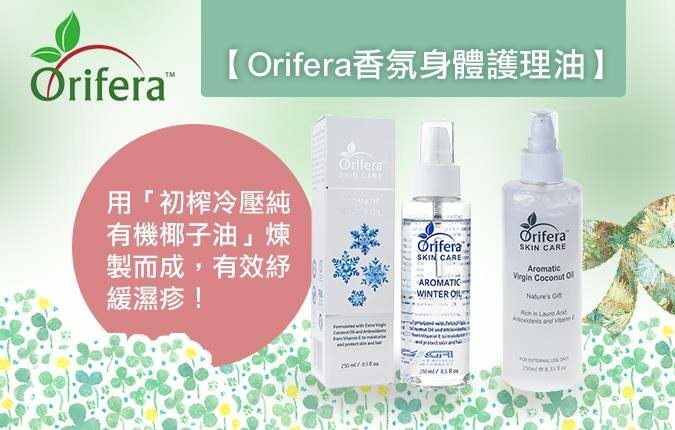 All Orifera products are certified by FDA, guaranteed low oxidation index and moisture content, hence the product quality remain good and longer shelf-life. Aromatic VCO is Malaysia's first body care oil using virgin coconut oil that contains therapeutic properties as base oil. It is rich in Lauric Acid, Vitamin E and antioxidant which help keep our skin, hair and nails healthy. Its small molecular structure allows for easy absorption after application, giving both the skin and hair a soft and smooth texture. Benefits: Aromatic Virgin Coconut Oil is rich in Lauric Acid, Vitamin E and antioxidant which help keep our skin, hair and nails healthy. Orders deliver within Malaysia will arrive 1 - 3 days after payment is received via Aramex with tracking number.